Kickstarter mid-point update: 70% funded, 14 days to go! 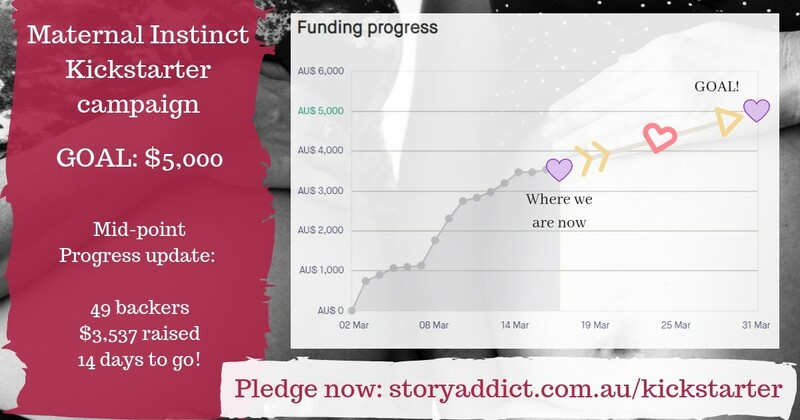 14 days ago I launched a Kickstarter campaign to raise the funds needed to publish my debut novel, Maternal Instinct. In those short 14 days, $3,537 has been raised by 49 backers! I have been well and truly overwhelmed by your support, thank you so much. Just 14 days and $1,463 to go and – if we meet the funding goal of $5,000 – Maternal Instinct will be published in October 2019 by Story Addict Publishing! Someone’s put together a funky algorithm that predicts, based on the first 14 days of previously successful Kickstarter campaigns, we’re probably going to make it to $5k. BUT only if we can keep the momentum going. $1,463 is around another 52 pledges for paperback copies, or 44 for signed copies, or 34 for signed copies with a book mark. Share the campaign with friends who you think might enjoy Maternal Instinct. Not sure who to share the campaign with? It’s entirely up to you, but I think a good start is to share it with anyone who would like a peek at what Australia would look like if we considered parenting to be the most important thing in the world. I think readers will enjoy Maternal Instinct if they loved The Handmaid’s Tale by Margaret Atwood, Big Little Lies by Liane Moriarty or Never Let Me Go by Kazuo Ishiguro. And yes, I know they’re all quite different books, so let me explain – Maternal Instinct has the feel of reading a Moriarty book (light, easy to read) with the subject matter of a future dystopian society with restrictions on women’s reproduction and parenting. The campaign runs for another 2 weeks, until 31 March. Let’s make it to $5,000! I’ve been posting updates on Facebook, Instagram and Twitter, so please feel free to follow along over there. I’ve also posted an excerpt from the novel. You can listen to or read it, whichever you prefer. Thank you again for helping to turn my story into a book. It means so much to me and I’m so excited at the prospect of sharing it with you all soon!